D’Anca’s Auto Collision, Auto Body and Classic Car Restorations in Palm Springs specializes in the specific and unique glass damage repair from wind and sand that is common to vehicles here in the Mojave Desert. We understand that our special weather and climate conditions create unique challenges to windshields and other automobile surfaces. The good news is we are ready and equipped to meet those challenges with our superbly trained technicians and high technology glass treatments that help to protect and preserve all automotive glass surfaces. Cracked or broken windshields can be particularly dangerous under our high wind and high heat conditions here in the Mojave Desert. Very often a rock chip or star in the windshield can be repaired easily, saving you the cost of a brand-new windshield. Even better, the work can be done with a minimum of downtime. 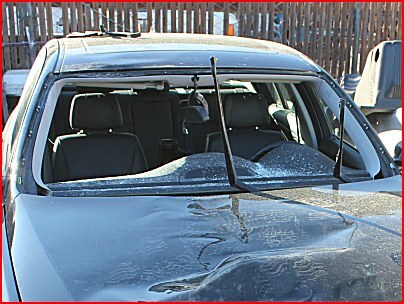 These kinds of glass damage are best managed when they first occur. With our special curing technique we are often able to restore your windshield to like new condition in about an hour. Our certified team of glass specialists will replace, restore, or repair any glass surface inside or outside of your valued automobile, quickly and efficiently. Even a slightly damaged windshield or glass window on your automobile can be high risk when the heat index or wind velocity is very high. The safety and well-being of you and your family is our utmost concern so call or come in immediately if you observe even a small chip or crack in the window surfaces of your vehicle. Repairing them early is key to saving time and money. Don’t take chances on a chipped or cracked windshield, no matter what the cause.